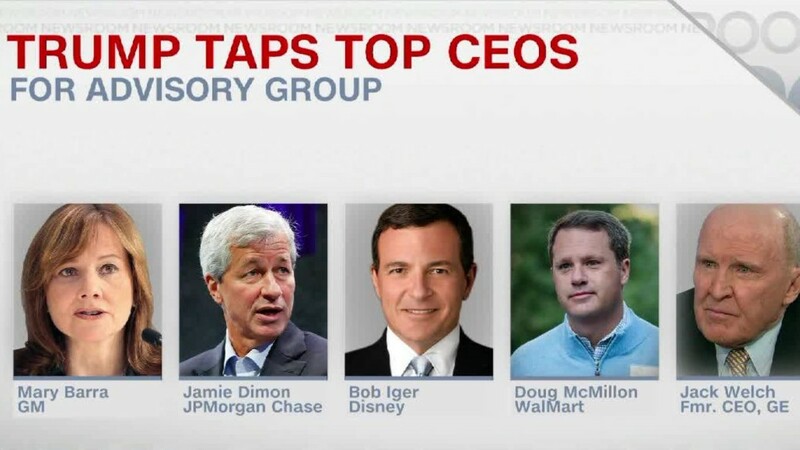 America's CEOs have a message for Donald Trump: We like you. There is perhaps no greater compliment CEOs can give Trump than this: U.S. businesses now expect to hire more workers and sell more stuff in the next six months because executives are optimistic about Trump's agenda. "America's business leaders are encouraged by President-elect Trump's pledge to boost economic growth," says Doug Oberhelman, CEO of Caterpillar (CAT) and chair of the Business Roundtable, a major business advocacy group that says it has been talking with the transition team. Confidence jumped after Trump was elected, according to Business Roundtable's latest CEO Economic Outlook survey of 142 top business executives. Even Trump's latest threats to slap 35% tariffs on companies that try to move jobs overseas isn't making CEOs nervous...yet. On Tuesday, Trump went after Boeing (BA) saying he wants to cancel the government's contract to build a new air force one because costs are "out of control." "I am worried about some of the rhetoric, but at the end it's all about job creation," says Oberhelman. Related: Will Trump keep his promise to women? Oberhelman gave a big thumbs up to Trump's plans to cut corporate taxes, spend more on infrastructure and scale back regulation. "The No. 1 concern CEOs have -- almost half [of them] -- are regulatory costs," Oberhelman said Tuesday. "We're not against regulation. Not at all. But we're for a smart, more effective approach." Change Labor Department rules on "everything from overtime rules to federal contracting"
Overhaul the permitting process to build bridges, highways, etc. "It takes so long to get permit to build a new bridge, modernize a highway or dredge a port," said John Engler, president of the Business Rountable and a former Republican governor of Michigan. Trump is planning to give a major speech on infrastructure later this month, says Engler. During the campaign, Trump's economic team put forward a plan to cut government regulation by 10%, a move they forecast would be a huge boost to economic growth and job creation. There's just one big warning sign from CEOs: Even after Trump was elected, they are still hesitant to do a lot more capital investment in new equipment and research. Business have been sitting on cash for years now and it's been a major drag on the economy. The latest Business Roundtable survey has only 35% of CEOs indicating they expect to do more capital spending in the next six months. That's actually a slight decrease from last quarter's survey. "Capex will follow economic growth," says Oberhelman. The CEO survey predicts 2% economic growth next year. Trump has promised 4% once he's president.